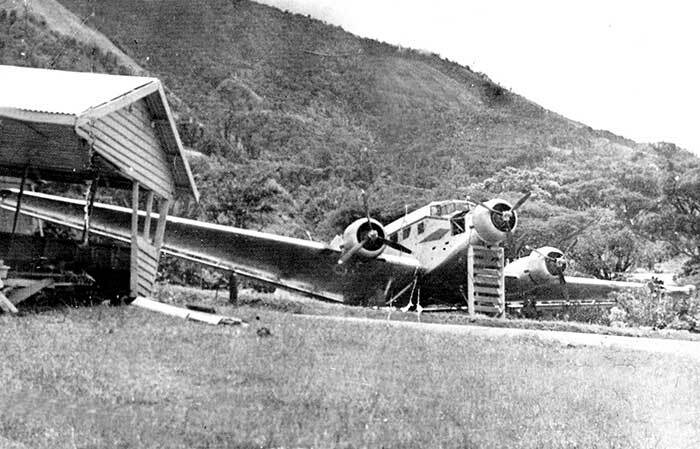 GSA pilot Peter Manser was making a down-hill takeoff on the sloping strip, carrying a heavy load of sawn timber. Just before becoming airborne the port engine suddenly lost all power, causing the aircraft to swing violently to the left and roll towards the Qantas terminal building and freight shed. The Qantas agent Mrs. Ivy Crawford saw it approaching and ran through the passenger room out on to the airfield and jumped over an embankment as the aircraft struck the building. The port wing sliced through the wooden structure, the roof collapsing as the Junkers kept rolling on to a road, tearing off its rear fuselage before Manser could bring it to a stop. The fuselage was broken into three sections and 12 feet was smashed off the port wing. The accident was probably caused by a loss of power, for reasons undetermined, at a critical stage of the takeoff.